Musicians experience the world a little differently, especially when it comes to their relationship with sound. Whether playing professionally, semi-professionally, or just for fun, musicians use sound to create art that profoundly impacts lives. But this art would not be possible without a musician’s first instrument: their auditory system. Hearing protection for musicians is essential, as it preserves both their auditory health and their ability to continue playing music. The great irony of a musician’s art is that it poses an occupational hazard. Musicians are four times more likely to develop noise-induced hearing loss and tinnitus than those who don’t play music. The very essence of a live musical performance – the volume and length of time that music is played – poses a risk to the musicians’ ability to work and can cause permanent hearing injury to those playing and those listening. For musicians, preventing hearing loss is critical for career longevity. And since musicians are not protected under the Occupational Safety and Health Administration (OSHA) standards, it is completely up to you to prevent injury. Annual hearing testing is the most valuable tool a musician has to prevent hearing injury on the job. Why? The only way for musicians to know if they are keeping their first instrument safe is to compare hearing thresholds year after year. Working with an audiologist will help you track any hearing deterioration, which can inform and change hearing protection strategies. Also, studies show that musicians who report hearing disorders use hearing protection more frequently than those who haven’t yet experienced any issues. You might think you’re being safe – your monitor levels are fine, you wear earplugs often enough, you haven’t noticed any changes, etc. – but it’s important to remember that hearing loss happens so subtly, the brain adapts to it quickly and easily. The only way to confirm you’re preventing injury is to compare your hearing from one year to the next. In addition, most people think of “hearing loss” as a perceived decrease in volume. While this is true, there is an even more insidious consequence of hearing loss that greatly affects musicians: hearing loss degrades pitch perception accuracy. Recognizing pitch is paramount to most musicians’ and audio engineers’ careers, but if you neglect your hearing health, you could unknowingly damage your perception of pitch. Finally, since the music industry is not regulated or protected by sound safety regulations like other industries, it’s especially important for musicians to have an audiologist on call. It is important that you wear hearing protection 100 percent of the time that you are exposed to loud sounds, including during sit-ins, sound checks, the opening band’s set, etc. Earplugs are a musician’s first line of defense against sound-induced hearing loss and tinnitus. While cheap foam earplugs are widely available, they can muffle or distort sound. Many musicians avoid cheap earplugs for this reason. Alternatively, high fidelity filtered earplugs are designed with music and communication in mind because they lower sound evenly across frequencies, making music sound more natural. Custom earplugs are also widely used by concert attendees to prevent hearing injury. Check out our Custom Filtered Earplugs page for more information. As you explore hearing protection for musicians, work with an audiologist to determine which option is best for you. In-ear monitors (IEMs) offer a solution to the poor sound quality and volume war that occur on stage when using wedge monitors. Musicians must hear themselves over a variety of competing sound sources, so regulating the volume of these speakers is difficult without IEMs. In addition, IEMs can be custom-molded to your ears, offering a better fit and improved sound isolation when compared to one-size-fits-all options. IEMs also boast improved pitch perception, portability, more consistent sound quality from venue to venue, and less vocal fatigue. But beware! IEMs are not safety devices even if they are marketed as such. IEMs can emit sound just as loudly as wedge monitors, and they will do so at your ear level. Also, research shows that when using IEMs, most professional musicians will play their mix at the same volume level as they did with wedges.The only way an IEM can be used safely is when the musician using it consciously lowers volume levels within their “mix,” or sound signal. The monitors and mix should be as efficient as possible. Ask yourself: What is the least amount of instrumentation and volume in your mix that you need to adequately do your job? 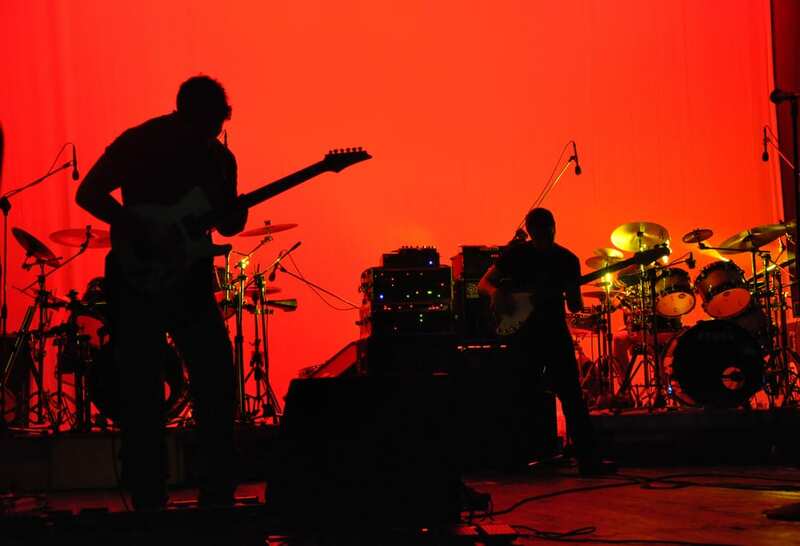 You have a daily sound dose that you don’t want to exceed, especially when you’re playing night after night. Another important factor of safe IEM use is to keep both earpieces in at all times, as one open ear is the most dangerous way to use IEMs. The practice of taking one earpiece out fills the void of ambient sound and spatial timing cues that fully isolating IEMs take away. With motivation and consistent practice, using both earpieces together can be done. Remember that since sound safety levels within the music industry are unregulated, it is completely up to the musician to monitor sound levels and in-ear monitor use. To learn more about the benefits of using your IEMs safely, check out our In-Ear Monitors page. OSHA Sound Safety Scale: According to the Occupational Safety and Health Administration (OSHA), you can listen to 90 dB of sound safely for 8 hours with a conversion factor of 5 dB. NIOSH Sound Safety Scale: According to the National Institute for Occupational Safety and Health (NIOSH), you can listen to 85 dB of sound safely for 8 hours with a conversion factor of 3 dB. Because these scales are logarithmic rather than linear, even a slight increase in volume can dramatically decrease your safe listening time. 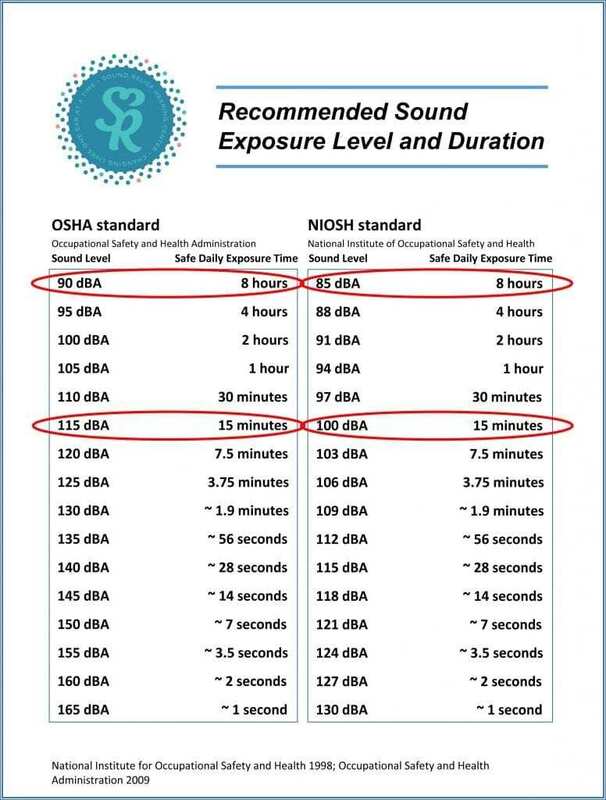 For example, using the NIOSH scale, you’re safe for a full 8 hours when listening at 85 dB – but at 100 dB, you only have 15 minutes of safe listening! The show must go on – but that can be a challenge when your hearing health is at stake. The audiologists at Sound Relief Hearing Center have the expertise to select the best hearing protection for you. If you would like to learn more about hearing protection for musicians, reach out to Sound Relief Hearing Center in Colorado or Arizona. We are independently owned, so we always have the patient’s best interests at heart. Plus, our state-of-the-art technology ensures that our patients receive the best treatment available. With our unparalleled excellence in the hearing industry, our dedication to patient care, and our commitment to helping people control and conquer their hearing issues, you can count on Sound Relief Hearing Center. To learn more about us, please browse our website, visit our YouTube channel, or give us a call at 720-259-9962. You can also schedule an appointment online to meet with one of our audiologists. We look forward to hearing from you!